Product prices and availability are accurate as of 2019-04-04 02:03:48 EDT and are subject to change. Any price and availability information displayed on http://www.amazon.com/ at the time of purchase will apply to the purchase of this product. 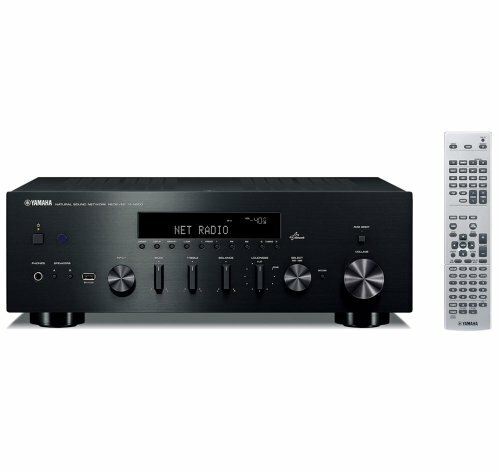 Superior sound stereo receiver combining ToP-ART technology and ART Base chassis construction provide for crisp, clean sound. Advanced features include continuously variable loudness control, Pure Direct along with Yamaha iPod dock connection, SIRIUS Radio Ready, 40-station AM/FM and zone 2 control gives an assurance of total music enjoyment. Offers the look and feel of the top-class A-S2000, with elegant aluminum front panel and silky touch volume/selector knobs. You can feel Yamaha's commitment to quality when you touch the knobs. Our ears lose sensitivity to high and low frequencies at low volume levels. This control lets you turn down the volume while maintaining the optimum frequency response. The iPod dock has an independent power supply to prevent operating or charging current from the iPod from flowing into the amp ground signal. This ensures optimum iPod sound quality. An unbalanced interface is subject to commonmode voltage noise, so Yamaha uses a balanced system to receive the iPod signal. This makes a significant contribution to reducing noise in the system for higher sound quality. The R-S500 preset remote control is designed to make it easy to operate the receiver's many functions. This Certified Refurbished product is tested & certified by Yamaha to look and work like-new. The product includes all original accessories, and is backed by a 1 warranty. This Certified Refurbished product is tested & certified by Yamaha to look and work like-new. The product includes all original accessories, and is backed by a 1 year warranty. ToP-ART (Total Performance Anti-Resonance Technology) design uses a symmetrical layout for accurate sound field reproduction and the ART Base to eliminate effects from external vibration. Music signals travel the shortest possible route, bypassing the buffer amp and tone, loudness and balance controls to virtually eliminate any signal degradation for the purest sound quality. These high grade speaker terminals have silver plating for best connection and outstanding durability. The pitch between jacks is wider for easier insertion. The quality of each individual part, as well as how they work together, basically determines the sound quality of any component. Yamaha uses only very high quality parts, carefully selected and tested.